Those of you who know me know that I know my way around booze and I also know my way around steampunks. (If you don’t know what steampunk is, think Jules Vern carried into the 21st century.) 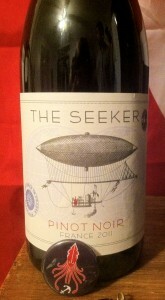 So it is fitting that I first discovered The Seeker Wines through the steampunk world. A friend of mine is a representative for Seeker Wines and he also hosts one hell of a room party. 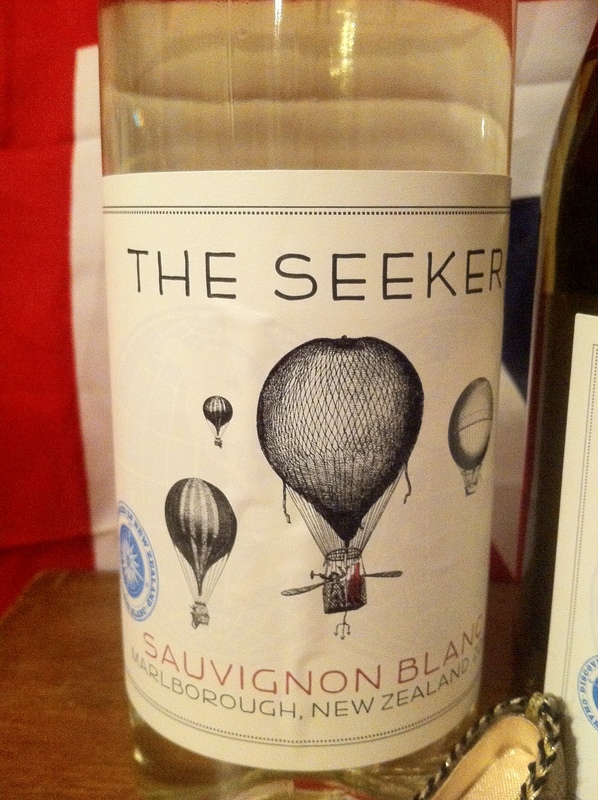 But when I got the chance to review Seeker Wines for my podcasts, I was thrilled to try them somewhere other than a party at a steampunk convention. Being constrained by a corset and already drunk are not the ideal conditions for a thoughtful and balanced tasting. 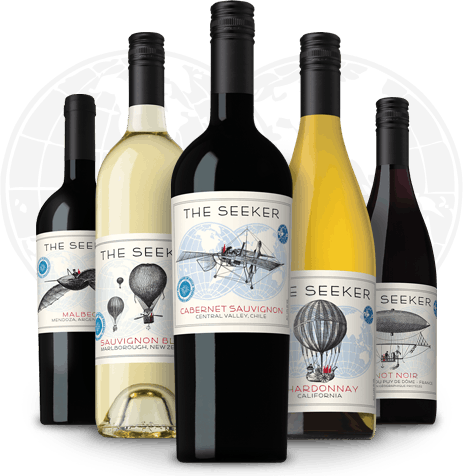 The Seeker Wines is a small, family owned company that seeks to source the best family owned wineries around the world and to bring them to the world with elegant labels and affordable prices. They have also hitched their wagon pretty firmly to the steampunk movement. Each wine has a whimsical flying contraption on the label and a steampunk explorer character who supposedly “discovered” the wine in some far off place. It has been awhile since I studied world explorers in 5th grade and at first I thought these were actual historical figures. Then I noticed that many of them were wearing goggles and one talked about fighting a giant metal octopus on his journey. I realized my mistake quickly at that point. 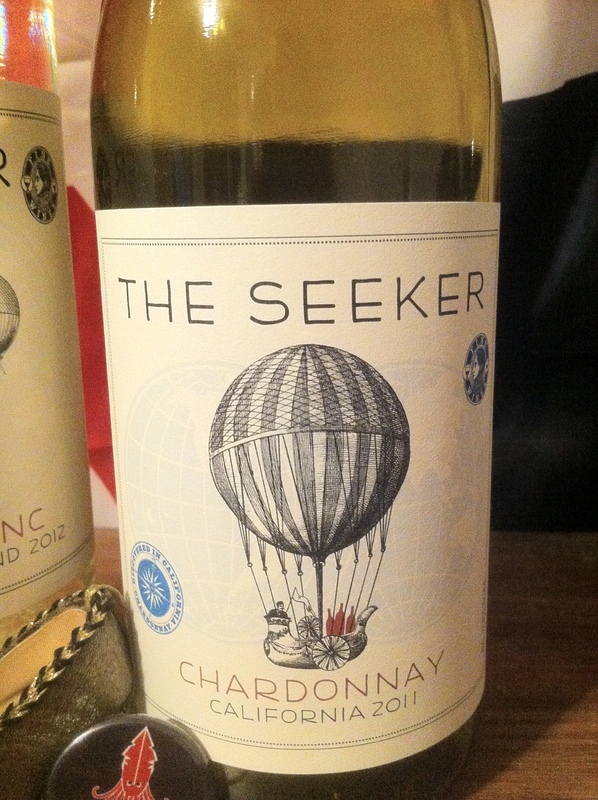 Seeker Wines currently has three red and two white varieties available and so we did a two-part tasting on the podcasts. The Charlie Tonic Hour Episode 67 features the reds which I am reviewing here, and for the whites you can listen to Bottoms Up Episode 8. So without further ado, here is what I think of each of the wines. Just to be honest to my own limitations, I am sadly unsure what many of winemaking phrases mean but I did gather that this is a wine that is not aged in oak and I could tell that right away. The fruit is more forward in this wine and there is a lightness and brightness that you don’t get from oak-aged wine. I found the tannins rather strong and it does have a very long finish. Personally I felt that the sweeter, fruitier notes on the front were a little weak in comparison to the strong finish but it does balance out better after breathing for a bit. Overall this is all an enjoyable wine but not one that I would seek out if it was inconvenient. Very much spicy and woody nose and a big bold taste. You can pick up on the oak very definitely. Unlike the Pinot Noir, this one did not calm down as much after breathing. This was one of Charlie’s favorites but for me I felt the oak was too dominate. However I could see this one working well with a steak or some strongly seasoned barbecue. On its own it might be too much but when paired with a flavor that can stand up to it I can see it improving. This one was the clear taste winner for both Charlie and myself. It helps that Cabernet Sauvignon is my usual go-to variety of red wine but this is a particularly complex yet well-balanced Cabernet Sauvignon. It is one of the few wines that I find the vanilla flavors to be really apparent but at the same time it is not overly sweet. In this wine the oak aging really does add a subtle and lovely hint of chocolate that rides just under the berries and then finishes with an assertive but not intimidating show of spice and tannins. I highly recommend this one. I do prefer un-oaked Chardonnays to oaked so this wine started with an advantage for me. The fruit is much heavier than any floral notes for me. Pear, citrus, and pineapple came over much stronger than anything else but it does have a really nice creamy mouthfeel. Good but not mind blowing. This is one of the more unique Sauvignon Blancs that I’ve ever had, and I’ve had quite a few because it is my mom’s wine of choice. It has a a stronger bouquet than is typical for this wine and a really nicely complex flavor. This is the first Sauvignon Blanc I’ve had that has a mint taste, and it came across very distinctly in addition to lime and apple flavors. Very light and bright, the flavor has an almost sparkly quality to the tongue even though there is no carbonation. And yet there is also an undertone of earthiness. Almost a moss flavor that does balance the spark and spice of mint and citrus. This was my favorite of the whites and one that I will consider ordering for my mom to get her opinion. If you want to try some of these lovely wines yourself you will have to order them from your local wine shop or online merchant. Or I have a more fun proposal for you. 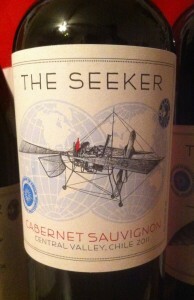 Seeker Wines is the official wine of The Steampunk Empire Symposium here in Cincinnati. 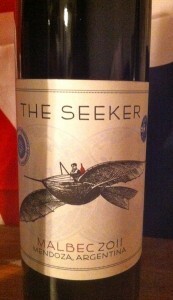 At the show parties both nights, The Seeker Wines will be available to try for all party goers. Despite what I said that the beginning of this article, parties at cons might not be the best place for serious tasting, it is officially the most fun way to try a wine.